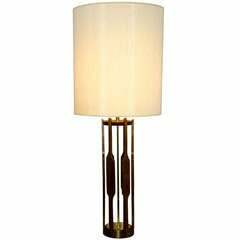 Beautiful and rare tall lamp by Modeline solid walnut base with polished brass fittings, this lamp has been totally restored new shade has been remade polished the brass, rewire with high and low switch , can take up to 100 watt light bulb, the wood has been restored , many hours of work put on this beauty. A beautiful and unique solid mahogany sculpted shape, table lamp with brushed steel accents, freshly rewired and polished the lamp shade its not included. 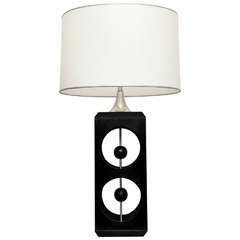 Mid-Century Modern lamp designed by Modeline, circa 1960s. This sculptural piece includes brass accents and a three way switch. Shade is not included. 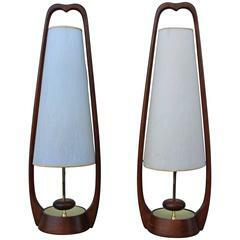 1960s modern walnut and brass table lamps with original fiberglass shades by Modeline. 1960s Mid-Century Modern walnut and brass table lamps by Modeline. With enamel detail. Measures: Height to light socket 27''. Shades for photography only. Stunning tall, 1960s walnut table lamp by Modeline. Sculpted wood frame and original nubby fabric shade. Retains Modeline Company tag. Brass accents. Shade is 17" by 19 1/2&quot; tall.